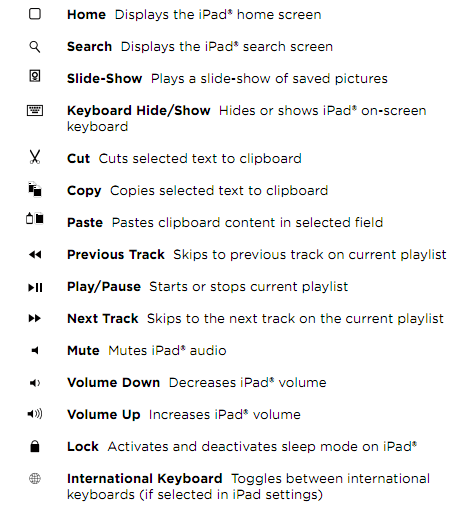 I have been using an iPad with a standalone Apple Bluetooth keyboard as a laptop replacement for a little over six months now. A good tablet/keyboard combination can be as a great productivity device for the majority of people, with added benefits such as instant-on functionality and built in 4G connectivity. Though one thing has been bugging me with my setup lately, portability. There just isn’t an easy way to carry around both an iPad and a separate keyboard without some sort of custom case or bag. Sure, it’s not terribly inconvenient, but enough to where I won’t bring the keyboard with me 95% of the time when running out because it’s just not easy. But now, this concern may be eliminated with the ZAGGkeys Proplus. This ultra-thin Bluetooth keyboard adds the utility an external keyboard to the convenience of a magnetic-attaching cover. 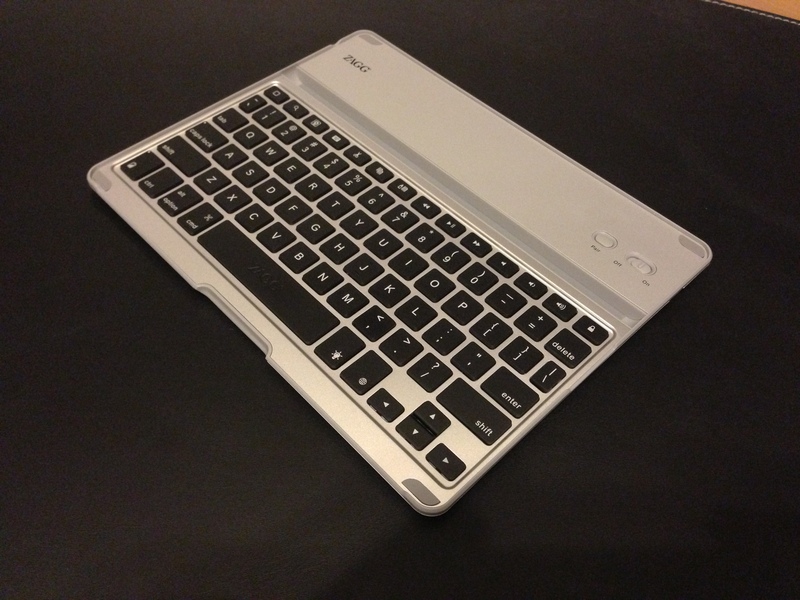 This ZAGGkeys Proplus keyboard was provided for review purposes by ZAGG, and is available through the ZAGG website. Battery Type: ZAGGfolio Bluetooth 3.0 keyboard uses a 510 mAh rechargeable lithium polymer battery. Battery Duration: battery will last for months on normal use without charging. The ZAGGkeys Proplus uses a long-life, lithium-polymer rechargeable battery that offers several weeks of normal use with just 1500mAh. 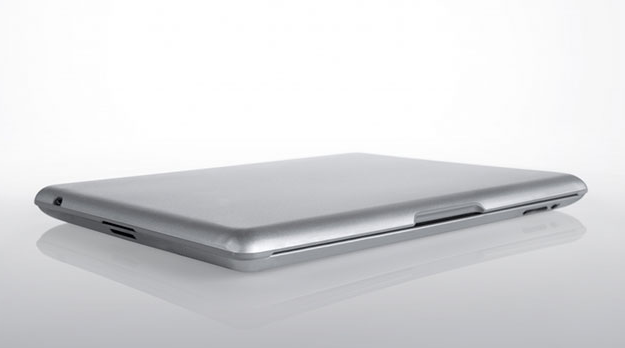 ZAGG claims that the 1,500mAh battery can last from 10 to 55 hours of continuous use, depending on brightness settings. The keyboard goes into sleep mode if it’s left on and not being used. Press any key and wait a second or two to bring the keyboard out of sleep mode. The battery has no memory, so ZAGG says you can charge it at any time. Of course they recommend you turn the keyboard off when not in use, but with such low power consumption, it really doesn’t matter. A status button on the keyboard lets you know how it’s doing which lights up to either green, yellow or red to indicate 100-50%, 50-20% or below 20% charge respectively. Keep in mind that when you get to the 20% area, this means 2-4 days before it shuts down for typical use. Clearly, this is the power-users dream battery scenario, and honestly, you’ll never find yourself worrying about the battery. When the battery finally does run out, a complete charge takes only 2-4 hours. 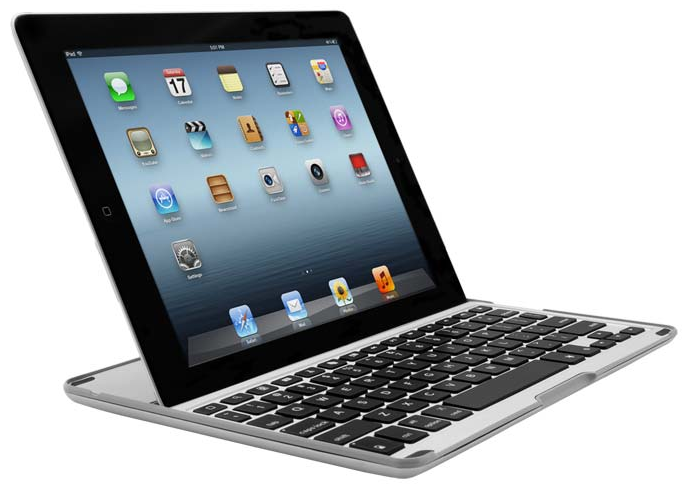 You’ll notice with any of the ZAGG keyboards, a lot of special iPad function keys. From the cut/copy/paste buttons to the Home and Lock keys, ZAGG took care to put on options that would be the most used, and most practical for the iPad. The lock button in particular was very nice to have, as I regularly turn the screen on and off during the day. Also, the search button made launching of apps nice and quick, with spotlight search as my preferred way to find and launch my program of choice. I picked up the third generation iPad the day it was released, and have had it in a leather folio almost the entire time I’ve owned it. This provides a good combination of a professional look to the device, and a bit protection from scratches and bumps against things. It goes with me to nearly every meeting and whenever I leave the house thanks to the built-in LTE connectivity. 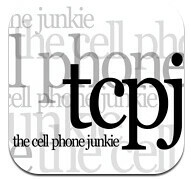 About six months ago, I got rid my MacBook Air in an effort to streamline my devices. To offset the lack of on-the-go productivity from not having a physical keyboard, I picked up an Apple Bluetooth keyboard to use when necessary. For the most part, the setup is good, as the Apple keyboards are well built and generally very comfortable. But when it comes to taking the keyboard with me, there aren’t a lot of options out there for good cases that incorporate it with the iPad. So, when I first saw the ZAGGkeys Pro and Proplus keyboards at CES this year, I knew instantly that this was a keyboard I needed to try. It’s incredibly lightweight, and acts as a very nice companion to the iPad with the magnetic enclosure that secures to the iPad and protects the screen. 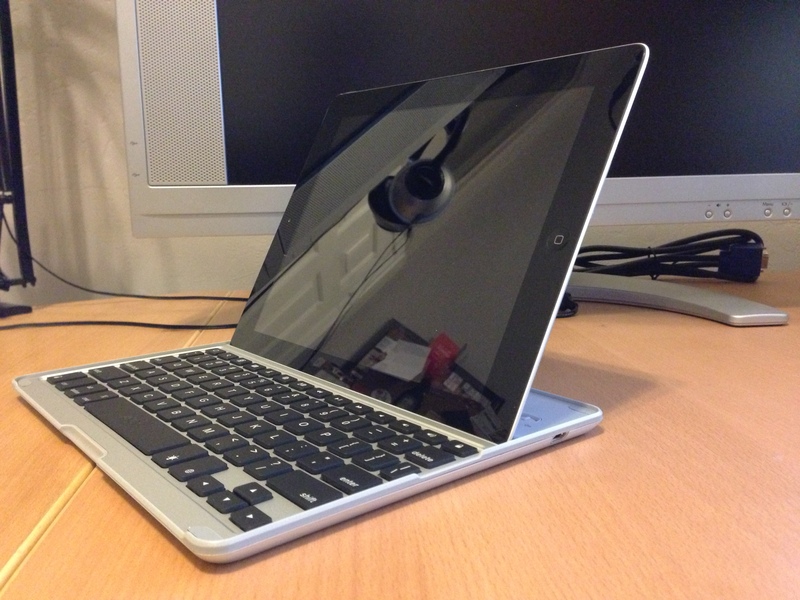 While similar to the Logitech Ultrathin, instead of a magnetic hinge, the Proplus has a magnetic gray plastic lip and to hold the iPad in place. The lighted keyboard on the Proplus model of the ZAGGkeys is something that most other external Bluetooth keyboards don’t provide. It’s a touch that makes it look a little more professional, even Apple-like in design. 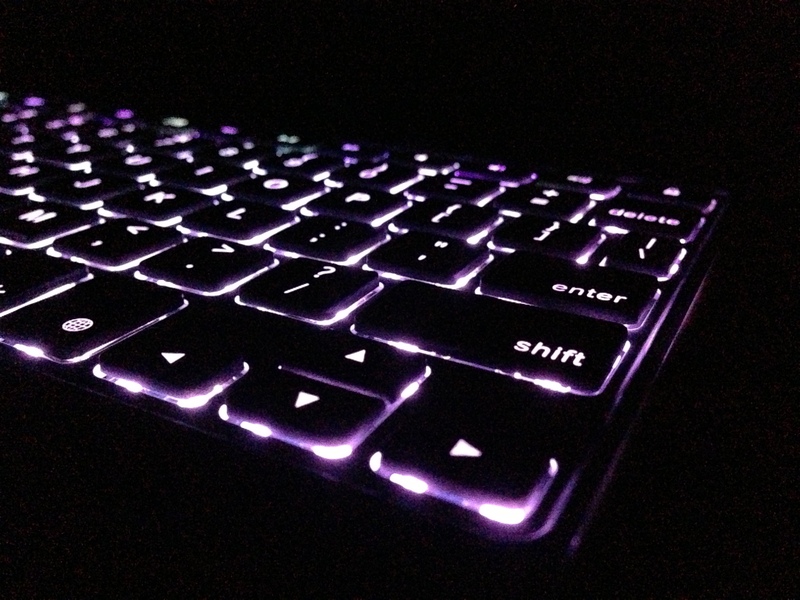 The way most of us use our mobile devices varies, but the back-lighting of keys ensures that you’ll be able to use the device in any environment without the need for external light sources. The integrated stand/”central groove” holds the iPad at a good viewing angle to promote ease of use for text entry or media consumption either in portrait or landscape mode. In my testing though, the iPad is too heavy to have propped in portrait mode, and it wasn’t stable enough to leave in this orientation. I also found out the hard way that you have to use gentle pressure on the iPad screen when it’s on the stand. 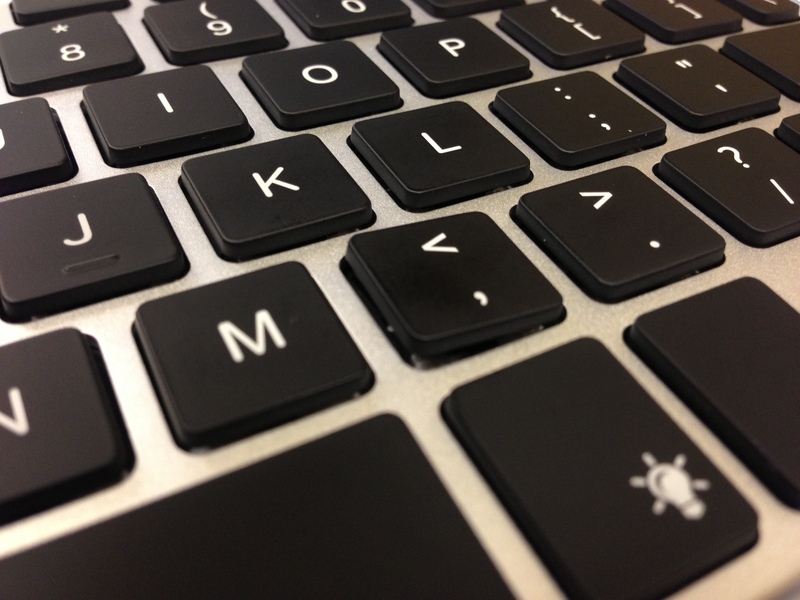 An overzealous pull-to-refresh on the email had the iPad crashing down behind the keyboard. Good news though, no damage to the iPad, and attempts to replicate the issue were met with pretty significant resistance. 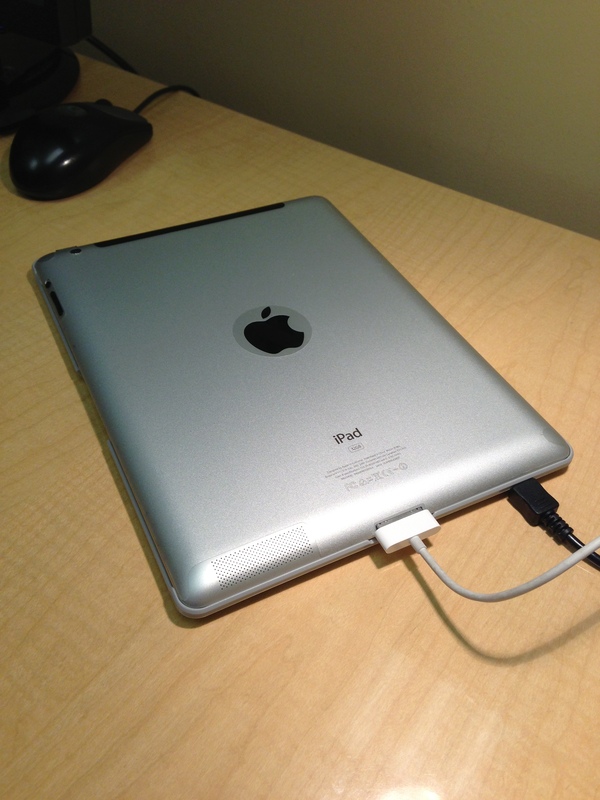 Also, use care when moving the iPad around, as it can easily come fall backwards out of the groove. 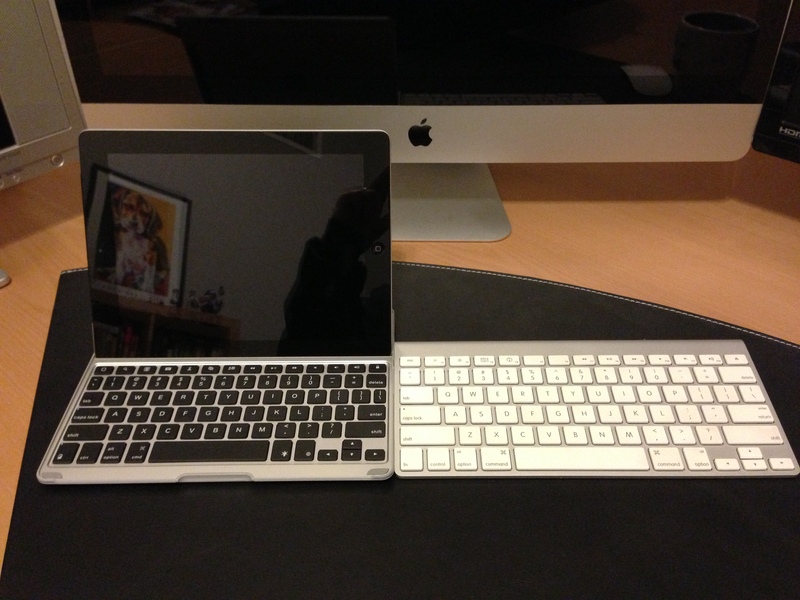 For actual use of the keyboard, I have to compare it to what I’ve been using, the Apple Bluetooth keyboard. 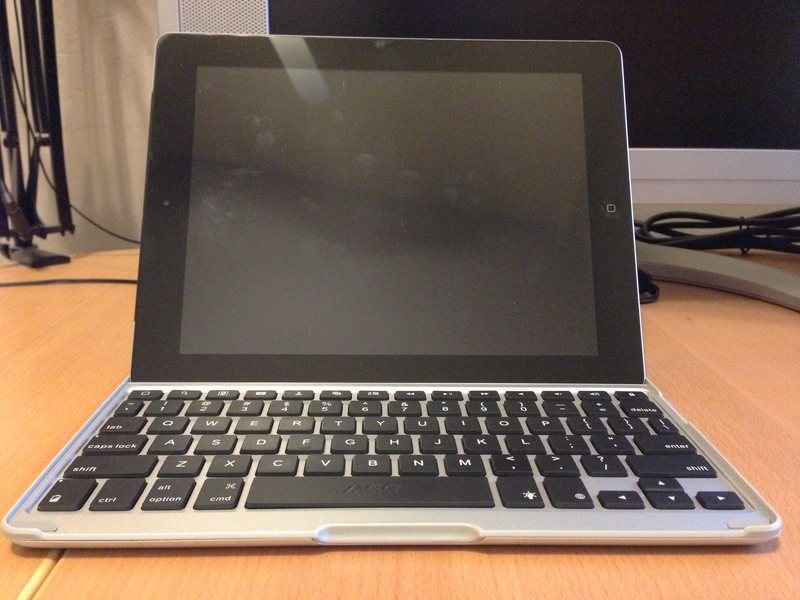 Granted, the size of the ZAGG keys are about half of that on the Apple unit, but the responsiveness is quite nice. I found that after just a few minutes of practice, my fingers were used to the size. Typing was quick, and I was able to hit 78wpm, just off my average 80-85wpm on the Apple keyboard. Overall, the quality of the Proplus is very good. However, I would be remiss if I didn’t mention that the unit I received initially from ZAGG had a defect in the “,” key. Note from the photo above that the key is cocked to the right a bit. I can get it to sit flush, but as soon as it’s depressed, it becomes “popped up” again. To their credit, ZAGG quickly acknowledged the issue, and sent me out a replacement. Like the previous models of the ZAGGfolio, the ZAGGkeys Proplus is light enough to take with you most places, and adds the convenience of a magnetic enclosure to attach to the iPad like a Smart Cover. When you’re on the go, and need to have a full size keyboard ready to use immediately, the combination of an iPad and the ZAGGkeys Proplus makes a great portable content creation machine. With it’s lightweight design and backlit keyboard, the ZAGGkeys Proplus is one of the most comfortable and practical iPad keyboards on the market today.